[Jesus said,] "You have heard that it was said, 'Love your neighbor and hate your enemy.' 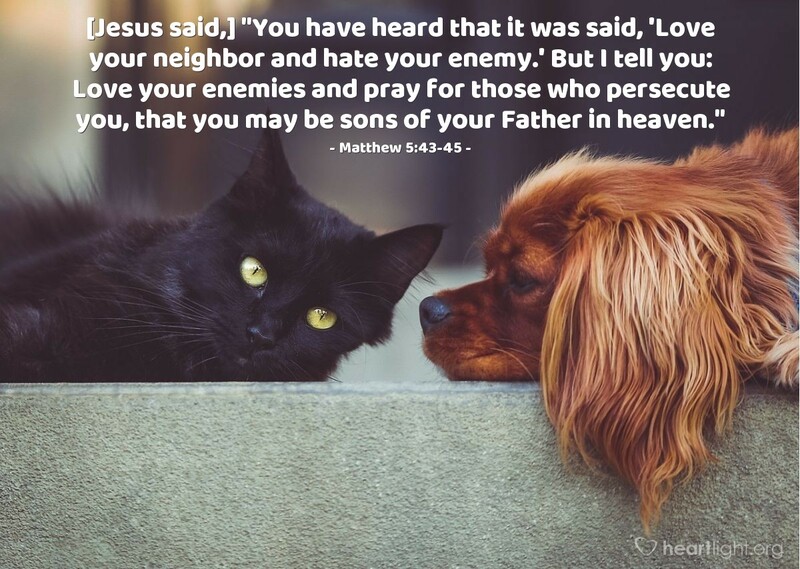 But I tell you: Love your enemies and pray for those who persecute you, that you may be sons of your Father in heaven." We often talk about the privileges of being a child of God — forgiveness, salvation, a future in heaven with him, the gift of the Holy Spirit, and ultimate victory when Christ comes. One of the greatest privileges we get, however, is the opportunity to act toward those who dislike and hate us in a way that reflects the character of God himself. Anyone can return hate for hate, but it takes a child of God to return a blessing and a prayer for his or her enemies. Father, thank you for loving me when I was still an enemy to you. Thank you for risking the death of your Son to offer me the chance to accept or reject your love. As you have promised, please pour your love into my heart so I may love even my enemies as you have loved me. In the name of your ultimate Gift of love, Jesus Christ, I pray. Amen.